Pompeii rises on a plateau of Vesuvian lava approximately 30 miles above sea level, overlooking the Sarno River Valley which was once part of a busy port. Origins of the city date back from the end of the 7th century BC. The city of Pompeii met with a horrific end when suddenly on the 24th August 79AD Mt. Vesuvius erupted violently and buried the city under ash and rock. Pompeii was discovered again in the 16th century but exploration did not begin until 1748 under the King of Naples Charles 111 or Bourbon. This excavation continued until the 19th century. More recent works of excavation, restoration and enhancement of the ancient city have seen an extraordinary wealth of architecture, sculptures, paintings and mosaics. 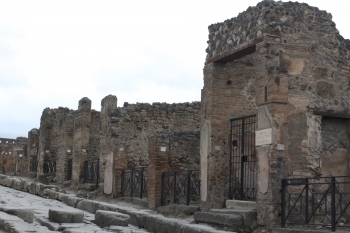 The archeological area of Pompeii extends for approx. 66ha, of which approx. 45 have been excavated. 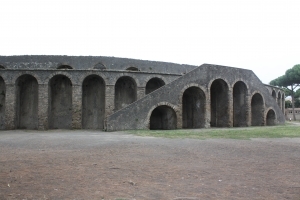 When the disaster occurred the people of Pompeii were not aware that Vesuvius was a volcano as it hadn’t erupted for over 1800 years and even though there would have been signs that Vesuvius was beginning to stir with earthquakes, ground rising up and underground springs drying up, the people did not know or understand what was happening. The eruption was very unusual, without lava or other normal characteristics of a normal volcano, it was a Plinian eruption – the most dangerous of all. This involved super heated gas, magma and ash that formed a giant column that built up. The ash covered the whole city in a very short time and people were turned to stone and preserved for thousands of years. Ash from the volcano was traced as far away as Africa. Excavation found the people of Pompeii preserved as they went about their everyday life and replicas can be seen of the people just as they were found. Walking through the streets of Pompeii you can almost feel the presence of the people who lived there, its an eerie but peaceful feeling and one of the most fascinating places I have ever been to. 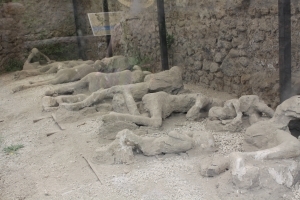 Even though I was aware of the story of Pompeii prior to my visit, nothing can prepare you for the actual experience you will feel when you are actually there. I was very surprised when I looked up at Mount Vesuvius as I had imagined it to be much taller than it was, instead it seemed fairly small, peaceful and surreal. Great footage on how Pompeii would have looked. Pompeii is 24.9km from Naples and is accessible by regular train services or buses. There are many tour guides available and group tours that are organized or you can choose to make your own way around with the help of a headset and recorded information. 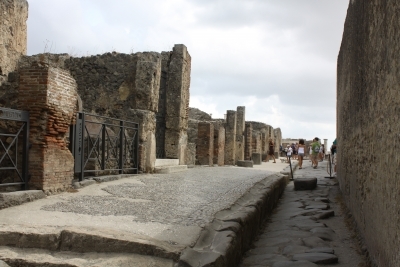 When visiting Pompeii you will need to allow plenty of time if you want to see the whole area. We allowed half a day which was no where near enough time to see everything. Pompeii is open from 8.30am to 6pm and closed on 1st January, 1st May and 25th December. A day pass is 11euros adults and children 5.50 euros. 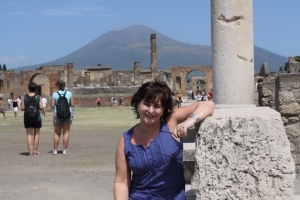 Send us your story, review or story about a holiday destination or experience in Pompeii, Rome or Italy.